Escape from the city and enjoy the unique relaxing experience of a traditional New Zealand bach situated right on the water front. Enjoy the tranquil country atmosphere, a safe swimming beach with abundant sea life and a reef to explore at low tide. Plenty of activities with surfing, swimming, diving and access to boat launching. Even if your desired dates are listed as unavailable please inquire to confirm. Pricing $140 per night for the first two adults. $50/ head for extra adults and $20 for children under 16. Long Weekends Min 3 night Stay. One night stays incur an additional charge of $50. No dogs - no exceptions. No rubbish facilities - you must take all rubbish with you. No rubbish services provided, you must take out what you bring in. As a family we love Russ’s Bach. We try to go every year and it always gives us wonderful memories. It’s the real deal, classic kiwi Bach. The rugged coast and the seals are wonderful to watch while you either have a bbq or sit in front of the fire. 5 stars! Russ's Bach is one of our most popular houses, just 5 m from the sea. A unique kiwi experience, so sorry we missed your visit. 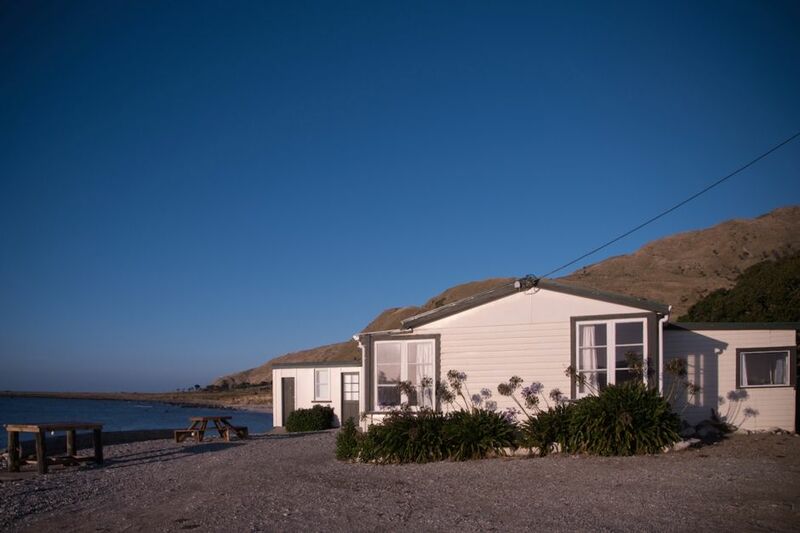 Russ's bach was the location of the original fisherman Russ Broughton who lived on the coast for around 40 yrs providing the station cooks with fish, paua and crayfish as well as commercially fishing.